The Best Of Broadway’s Roaring Twenties (VIII) | THAT'S ENTERTAINMENT! 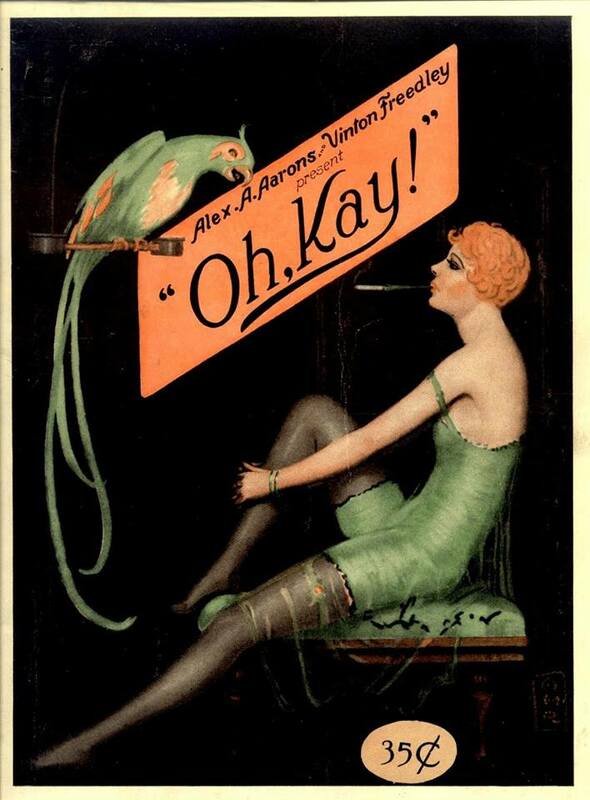 When I think of ’20s musicals, I think of Oh, Kay! 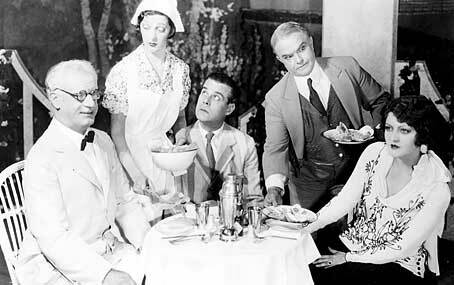 Of course, I also think of Show Boat (1927), No, No, Nanette (1925), and Good News! 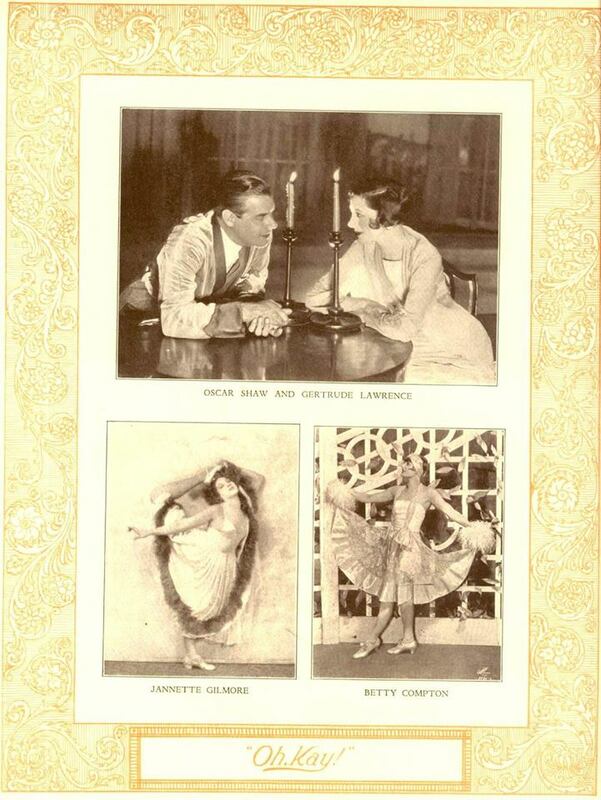 (1927), but those are all exceptions — and have been performed with wonderful regularity over these past 90 years. 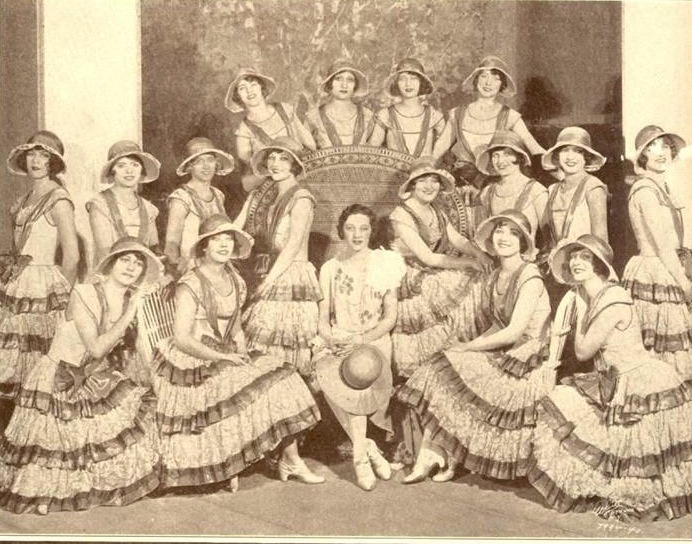 But Oh, Kay!, while a gold standard in musical comedy (as I hope to prove in this post), is more indicative of the 1920s book musical as a whole — excellent songs by classy composers (in this case, the Gershwins), a cast of clowns and starlets (in this case, Victor Moore and the iconic Gertrude Lawrence), and a farcical plot that really typifies the era (as you’ll see below). 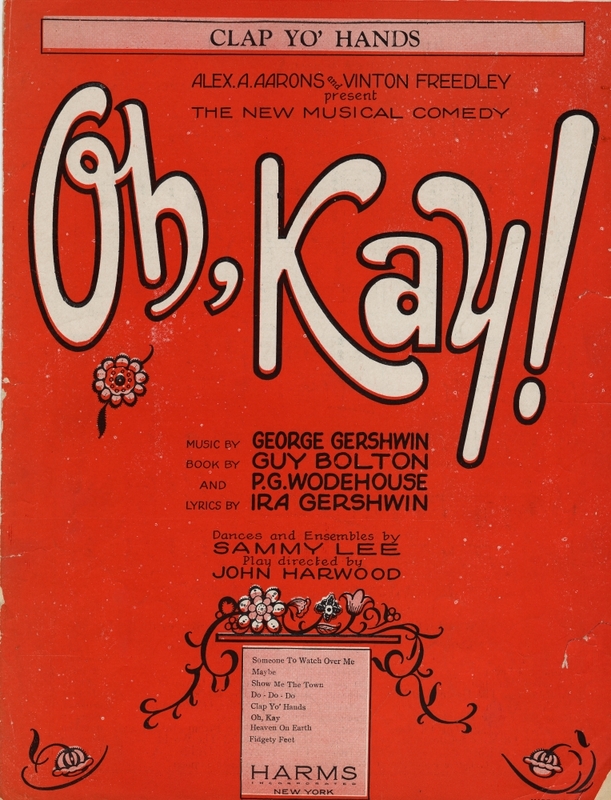 I think that if we needed to choose a delegate to represent all ’20s musicals at a conference of musicals from every decade, we could do no better than in choosing Oh, Kay! The plot concerns wealthy ladies man Jimmy Winter (Oscar Shaw), who is returning to his Long Island estate with his new bride, the overbearing Constance (Sascha Beaumont). This poses trouble for a pair of bootleggers, the Duke of Durham (Gerald Oliver Smith) and his sister, Lady Kay (Gertrude Lawrence), who along with their two assistants, Larry Potter (Harland Dixon) and “Shorty” McGee (Victor Moore), have been stashing illegal booze in the house. Before they can remove the hooch, the newlyweds arrive. Thinking fast, Shorty sends away the hired butler and maid, and poses himself as the new butler. Wedded bliss falls short of expectations, however, when Jimmy learns that his annulment to his first wife never came through, and his recent marriage to Constance is illegal. After Constance leaves in a huff, the pistol-packing Lady Kay barges into the house while trying to evade the revenue officers. Remembering her from the previous summer, Jimmy agrees to hide Lady Kay. But when the Revenue Officer (Harry T. Shannon) catches them together, Jimmy passes Kay off as his new bride. As a storm rages, Jimmy lets her spend the night. Larry and the Duke return the next morning looking for Kay, while a gaggle of girls descend upon the house for Jimmy. As Kay and Jimmy keep up their front for the revenue officer, Constance returns with her father, Judge Appleton (Frank Gardiner), who intends to perform a legal ceremony for Jimmy and his daughter. Kay overhears this while hiding in the bedroom, dons a maid outfit, and passes herself of as Jane, Shorty’s wife. The second act picks up as the charade continues. While Larry tries to remove the booze from the basement, the butler and maid (Shorty and Kay) are forced to serve lunch to Constance and the Judge, with farcical results. The revenue officer returns and is confused to learn that Jimmy is getting remarried and that Jane looks exactly like the bride he met the previous evening. With the help of a pair of twins (Madeleine and Marion Fairbanks) that have been chasing Jimmy, Shorty and Kay convince the officer that lookalikes are common. Plans for the wedding continue, even though Jimmy has made it clear that his heart lies with Kay. She and Shorty concoct a plan to halt the ceremony. As the wedding is about to start, Shorty disguises himself as a revenue agent and claims Jimmy is arrested for alcohol possession. But the real revenue officer shows up and arrests Shorty, Kay, and Jimmy. He locks them in the basement while the booze is trucked away. Fortunately, the bumbling agent forgot to lock the door, so the trio escapes. Jimmy throws a party that evening for his new bootlegging friends where the revenue officer reveals that he’s actually a famous pirate, Bluebeard, and has just stolen all their liquor. But they have news for him: the truck drivers who carted away the booze were working for Shorty and Larry. Blackbeard tries to enact his revenge by deporting Kay, but Jimmy puts a stop to that: he produces their new marriage license as the curtain falls. If the plot sounds familiar, perhaps it’s because you’ve seen it in the most recent Gershwin jukebox musical to play Broadway, Nice Work If You Can Get It (2012). Of the three major jukebox Gershwin musicals to play Broadway in the past 30 years, My One And Only, Crazy For You, and Nice Work If You Can Get It, the latter has the distinction of using a book closest to its source material. (The other two, which take their “inspiration” from Funny Face and Girl Crazy, respectively, have obviously less in common.) But this is no surprise — Oh, Kay!‘s book has everything that a classic ’20s plot needs — bootleggers, weddings, and stars in disguise. For modern audiences, that last facet is perhaps the most elusive. Sure, we have stars, but fewer and fewer of them are coming from the stage. Additionally, the whole culture of stage stardom has changed. 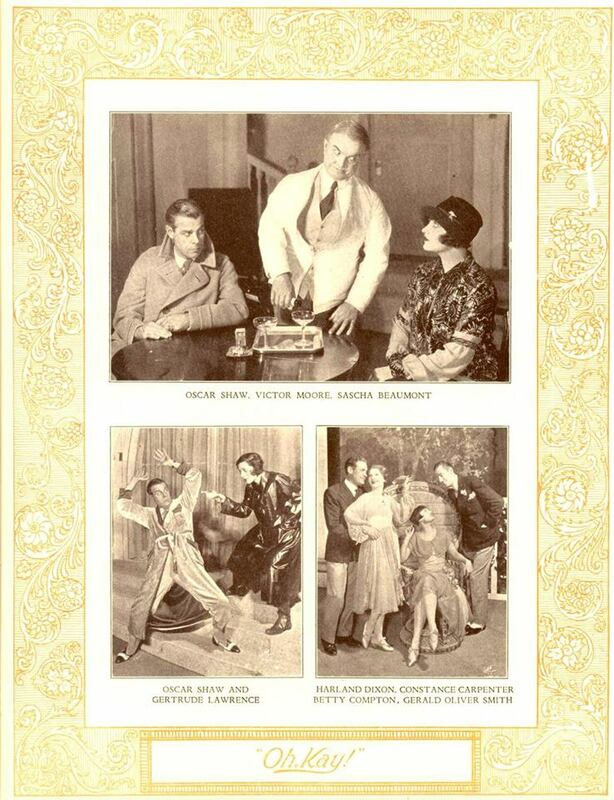 It’s a little foreign to grasp the idea that stars of the ’20s and ’30s had books and scores crafted AROUND them instead of vice versa. Also from the London recording, here is “Clap Yo’ Hands,” which although given to Larry in the Broadway production, was given to Claude Hulbert’s Duke across the pond. 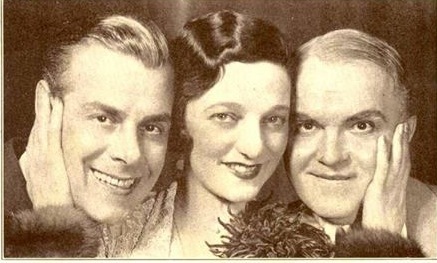 Lehmen Engel featured the majority of the score in a 1955 studio recording that included Barabara Ruick and Jack Cassidy. From that album, here’s “Don’t Ask,” a charmingly catchy number for Larry and the twins. From the same recording, here is the utterly romantic “Maybe,” one of my favorite underrated Gershwin tunes. Also from that recording, here is Patrick Cassidy and Larry Larsen with Larry (and one of the twins’) big dance number, “Fidgety Feet.” WARNING: This one is infectious. Come back next Monday for another 1920s musical! And tune in tomorrow for the best from the final season of Green Acres! Hi, Katharine! Thanks for reading and commenting. You’re absolutely right. Those characters were named intentionally. Hi, Lyndsy! Thanks for reading and commenting. Indeed, but, sadly, there are no recordings of him performing the number — or any of his numbers.